Ron Sharp is one of Australia’s best known organ builders. His largest and most important work was the Sydney Opera House organ. This portative organ is the smallest he has made. It is an original design and is one of eight made of a variety of timbers . All are beautifully made and it is unlikely he will make more. Ron is a self taught craftsman, very involved with concept of creativity. He is interested in finding new solutions to the old problems inherent in organ building. 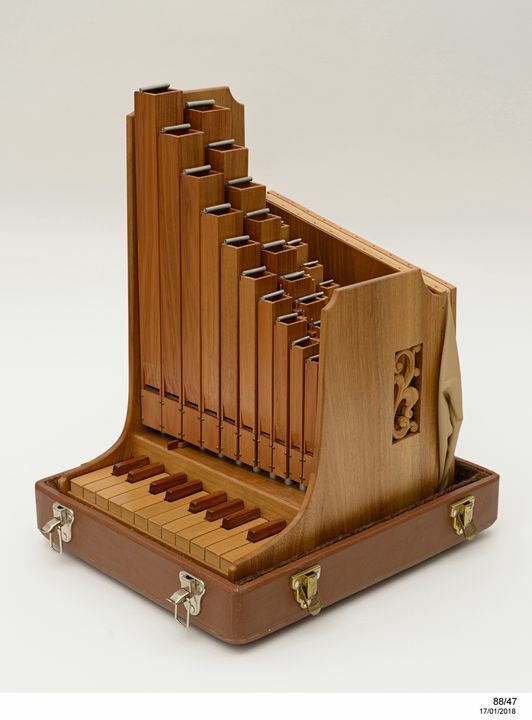 Single manual, 20 note compass G-d1; 40 rectangular pipes in four rows, made of Tasmanian blackwood and Tasmanian myrtle; coupler switch; natural keys of Maracaibo box, accidentals keys of mulga; leather bellows at rear. [Queensland] walnut case with rectangular carved, foliate panel on each side. Purchased with the assistance of the Visual Arts and Crafts Board of the Australia Council and Mojo MDA, 1988.